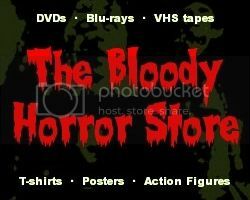 Dr Blood's Video Vault: Happy Hallowe'en! If you are thinking of seeing "Saw 3D" tonight then you might want to read my review. I'm going to be watching anything but horror films for Hallowe'en because that's how I roll. I might go out "Trick or Treating" later though because I just can't get enough of stale dollar store chocolate or apples with pins in them.